Browse: Home / giant_backdoor – windows backdoor diagnostic tool. giant_backdoor – windows backdoor diagnostic tool. 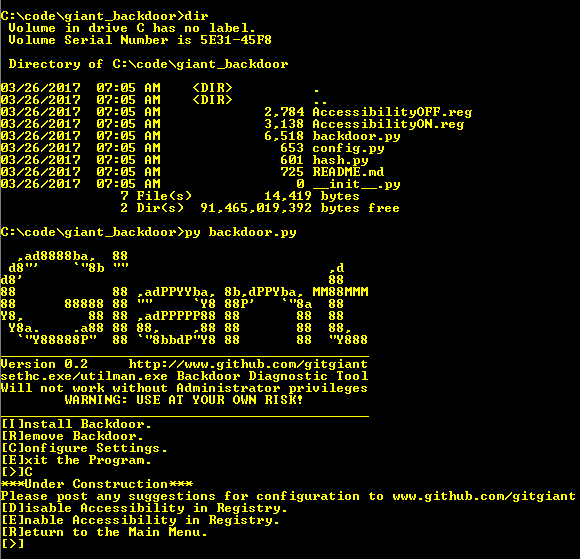 giant_backdoor is a tool to Detect and uninstall a sticky keys or utility manager backdoor, which allows unauthorized access to a system level command prompt at the login screen. Checks if setch.exe or utilman.exe have been replaced, compares their hashes against cmd.exe, explorer.exe, and powershell.exe. Checks if setch.exe or utilman.exe have had any debugger registry keys added and removes them if necessary. Install sticky keys or utility manager backdoor by adding debugger registry keys, use at your own risk! ← Seth – Perform a MitM attack & extract clear text credentials from RDP connections.